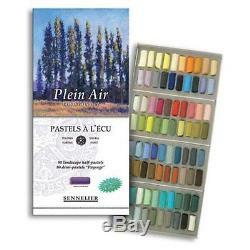 PRODUCT : SENNELIER SOFT PASTEL SET - HALF LENGTH - 80 LANDSCAPE COLOURS. DESCRIPTION : Sennelier extra-fine soft pastels are water soluble and have unparalleled pigment intensity. Some of their darker pigments have a slightly different texture, as no fillers are used. Sennelier has continued a cherished tradition of not adding clay as a binder and smoothing agent, thereby keeping the outstanding intensity of the rich pigments and brilliance of color temperature. Their soft, gentle stroke delivers a solid, powerful line of intense color. In recent years, a newly improved formulation on some of the fragile colours and a 20% larger diameter than their previously manufactured sticks, combine to offer exceptional value with the largest and most treasured historical maker of soft pastel brands. Half-Sticks: The half stick size is valued as much for being sturdy as it is for being economical. The low price point enables artists to afford far more colors. Half Stick pastels have the exact same pigment and binder composition as the full sticks but they are shorter and fatter. Perfect for Plein Air or studio. The item "Sennelier Soft Pastel Set Half Length 80 Landscape Colours" is in sale since Wednesday, July 25, 2012.